For decades Colombia was in the international press for all the wrong reasons – drugs, kidnappings and civil war. Now with a peace agreement in place between the FARC and the Colombian government and a significant decrease in drug related violence, Colombia is much safer and tourism has skyrocketed in the last ten years. From the coffee to awe-inspiring beaches to the infectious care-free spirit of its people, Colombia will leave its mark (in all the right ways) on curious travellers. Travelling in Colombia still requires caution but with planning and smart precautions you can have a safe and positive experience in this remarkable country. We spent three months travelling throughout Colombia and its probably our favourite place in South America. These are our top tips for staying safe in Colombia. Colombian people are proud and happy that you have chosen to visit their country and keen to look toward the future. While crime rates are lower than they’ve ever been in Colombia, there is still a risk of pickpocketing and robbery. Don’t do drugs. Seriously. Sure, it’s the cocaine capital of the world, but it’s also still completely illegal. Stories abound of undercover cops posing as drug dealers to get a bribe, of backpackers getting mugged by the guys they go to buy from and, terrifyingly, foreign tourists winding up in prison for breaking local laws. Never leave bags unattended on buses. Always keep your daybag on your lap. Avoid walking alone after dusk, especially if you’re a girl. There are a number of taxi apps available in Colombia (Tappsi and Cabify) which allow anybody with data to get home safe. Avoid hailing taxis on the street and book through an app. Robbery of taxi passengers does occur and its important to book a licensed taxi to avoid this. Take advice from hostel staff about no-go areas. After all, this is their home and they’re in the know. Take the minimum out in terms of cash and cards. When exploring, keep the rest safely locked up in your hostel locker. Buses are safe, but avoid travelling on rickety old ones overnight. Pay attention to where you’re going, not what’s on your phone. That said, even the most prepared traveller can find themselves in a dangerous situation. Should this happen to you, do as the assailant asks and hand over the goods. The chances of armed robbery here can be significantly higher than elsewhere in the world, and no expensive bit of tech is worth your life. Scams, although not rife, do happen occasionally in Colombia, particularly in large cities. Only use official taxis, and confirm the expected fare prior to setting off. This will prevent the driver turning a ten minute journey into a money-making 30 minutes. Secondly, check your change correctly. Swapping out big notes for small ones, or giving you counterfeit money as part of your change is not uncommon, so try to pay the exact amount if you can and keep an eye on the driver when settling up. Be aware of distraction techniques. Always keep an eye on your belongings, don’t leave phones or expensive cameras on tables in restaurants and if someone engages you in conversation be aware of your surroundings – and specifically of anything that may be in their (or their mate’s) reach. Don’t always trust a police officer. Technically, it is illegal to walk the streets of Colombia without official ID (although a passport photocopy is usually adequate). If you’re stopped by a police officer and asked to show this or to have your pockets checked, request to go to a police station or public building to do so. Corrupt and/or fake police officers have been known to steal money or plant drugs on unsuspecting individuals. In general you’ll have a safe experience in the popular, major tourist hubs of Colombia. Be careful venturing off to other regions. In particular avoid the provinces of Antioquia, Arauca, Caqueta, Cauca, Choco, Guainia, Guaviare, Meta, Narino, Norte de Santander, Putumayo, Valle de Cauca and Vichada. Medellin, Popayan, Quibdo, Villavicencio, Pasto, Ipiales and Cali have a lower risk within these provinces. The Venezuelan and Ecuadorian borders experience high levels of drug-related criminal activity and these areas should be avoided completely. As in any cosmopolitan city, take care whilst clubbing. Pay close attention to your drinks to avoid having it spiked by borrachero. Otherwise known as ‘devil’s breath’, this tasteless and odouerless hallucinogenic drug can be added to anything including food, drinks and cigarettes. Less frequently used on travellers than urban legend would have you believe, its existence is a sober warning to never accept drinks from strangers or leave them unattended. There are few places in Colombia that are experiencing such a tourism resurgence as beautiful Cartagena on the Caribbean coast – and with that comes the familiar question, ‘is it safe?’. Avoid the city walls late at night. They may be beautiful, but romantic late-night strolls have ended badly in this part of town. Be aware of pushy street vendors flashing items in front of you – it’s often part of a distraction technique. While you’re trying to say no, another person is relieving you of your valuables. If you’re staying in the Getsemani area (where the majority of the hostels are), be sure to stick with a friend when heading back at night. The chances are you wouldn’t go home on your own after night out in the UK, so just keep your wits about you and do the same here. Touts have found a great deal of business offering private tours around the city. Whilst the tours themselves don’t pose a real risk, many tourists are paying over the odds. If you’d like a tour, book instead through your hostel or an established tour company. The good, the bad, the beautiful and the ugly can be found in everywhere from Coventry (okay, maybe not so beautiful) to Cartagena, from Marrakesh to Medellin and beyond. Colombia is one of the up-and-coming backpacker destinations in the world for good reason and, when approached with common sense and an awareness of its general safety issues, most backpackers will discover exactly why everyone loves it so much. Stay safe and enjoy this beautiful country. Blogging at Along Dusty Roads, Andrew and Emily inspire everyone to travel more, travel better and travel more beautifully. Whether it’s discovering the hipster area of an old European city, trekking through the rainforest in South America or road tripping around the Scottish Highlands, they think there’s an adventure, a story and a new discovery to be had wherever you go – and they’ll show you exactly how to find it! You can also follow Along Dusty Roads on Instagram, Facebook and Twitter. 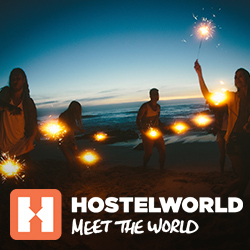 The post Top Tips for staying safe in Colombia appeared first on Hostelworld Blog.